Unfortunately our #MeToo Support Group will NOT be taking place in February due to 2/18 being President’s Day. If you are seeking support, please call our 24/7 Multi-Lingual Crisis Line as it will still be available at 916-428-3271. If needed, one of our counselors/therapists can follow up with you, and potentially schedule an individual appointment. Support group will begin again on Monday, March 18, 2019. 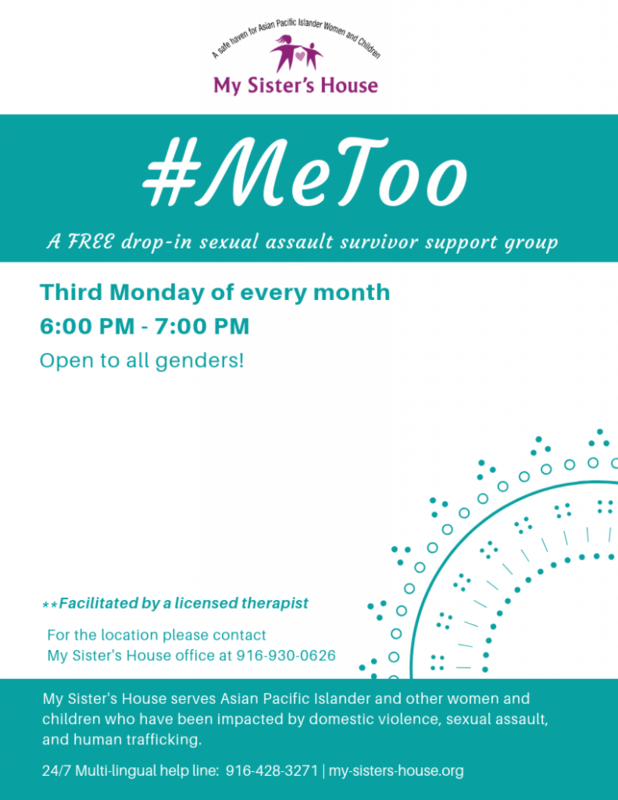 Join other survivors for this #metoo group and receive some support in this safe space for sexual assault survivors. For more information and for the meeting site, call My Sister’s House at 916-428-3271 or email us at info@my-sisters-house.org. This group is drop in, free, and open to all genders and ethnicities. It doesn’t matter where or when it happened, if it still affects your life in any way, you are welcome to join us.